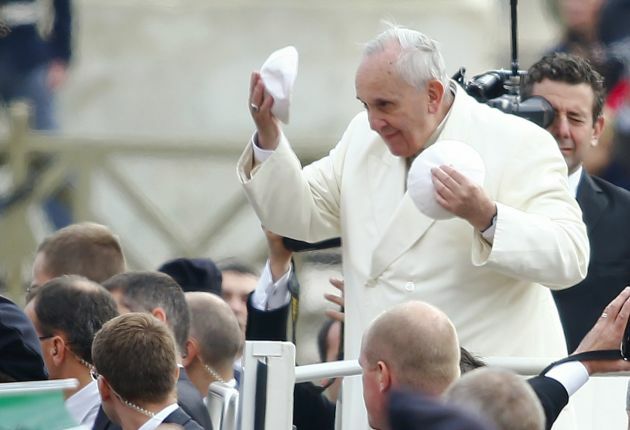 (Photo: REUTERS / Tony Gentile)Pope Francis receives a new skull cap as a gift as he arrives to lead the Wednesday general audience in Saint Peter's square at the Vatican October 29, 2014. How does the divine creator figure in the theories of evolution and the Big Bang? Giving a glimpse at his thoughts on the thorny issues, Pope Francis told the Pontifical Academy of Sciences that both theories required "the intervention of the divine creator," who allowed it to happen. "The Big Bang, which today we hold to be the origin of the world, does not contradict the intervention of the divine creator but, rather, requires it," the Pope said before experts at the science academy. "Evolution in nature is not inconsistent with the notion of creation, because evolution requires the creation of beings that evolve," Francis noted, The Independent newspaper reported October 30. The Catholic Church has sometimes been viewed as at loggerheads with the science community. Among its notable displays of contradiction was during the Renaissance period when it forced Galileo to retract his theory that the earth revolved around the sun. The Church banned the publication of the works of Galileo, who was tagged as a heretic as part of the inquisition, when he refused to yield to its demands. The Church issued an apology through a declaration by St. John Paul II in 1992 when he was the Pope. Francis warned about taking the creation account in the Book of Genesis literally, explaining that reading the passages at face value might give an impression that God waved a "magic wand." "When we read about Creation in Genesis, we run the risk of imagining God was a magician, with a magic wand able to do everything," Francis said. "But that is not so." "He created human beings and let them develop according to the internal laws that he gave to each one so they would reach their fulfilment," he pointed out. But Francis's remarks tied in with the ideas of Pope Pius XII, who welcomed the ideas of evolution and the Big Bang.